I love the bright, cheery pattern. 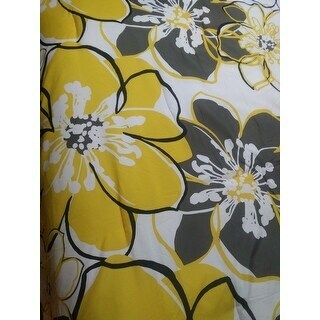 I purchased this set in yellow for a twin bed and also in aqua for a queen bed. I'm very pleased with the quality and durability. This floral-patterned comforter set by Mi Zone livens up your existing bedroom decor with pops of vibrant yellow. Dark grey and black accents round out this contemporary, artful design. Beautiful and functional, this set features hypoallergenic, polyester construction, providing a more restful night's sleep for allergy sufferers. A medium warmth rating makes this comforter set perfect for cool nights. Enjoy comfortable, restful sleep with this MiZone Mackenzie comforter set that features a special hypoallergenic construction to ensure a healthy sleeping experience. Provides a more restful night's sleep for allergy sufferers. I had a hard time finding a comforter that I wanted due to all the reviews being about style and how the comforter "looked" on the bed. Well, I was not looking for style, I was looking for comfort. I live in Florida so the weather is very up and down in the winter time. This comforter is perfect warmth if you leave the windows open on our coldest nights and perfect warmth for covering up at night with the A/C on our hottest nights. I would recommend this product if you are looking for comfort and warmth. It is very pretty too, I liked the pattern but my bed is never made so I do not know how the set "looks". As far as I am concerned, this comforter does its job. I purchased this comforter set for some guests I had coming for a visit. On a positive note: It was exactly as described. All descriptions, colors and the size were all exactly as described and as I expected. It was also delivered in a timely manner and was completely in tact when it arrived. I have purchased from overstock before and will again... My problem is specifically with the blanket. I washed it for the first time and then put in the dryer.. I set the dryer for only 6 minutes to then hang over my balcony to air dry the rest of the time. When I took the blanket from the dryer it was shriveled and had burn holes everywhere. It had melted and molded together. I was shocked and very disappointed. Needless to say I had to throw it away without even getting the chance to use it once. I threw out the pillow cases as well just to be safe. In my opinion this blanket is a huge fire hazard. Very nice comforter set. The pillow shams are not exact replicas of each other. One has the bold yellow flower print, the other mostly black and white. Comforter is comfortable, good size for queen. The yellow is bright and festive, not canary yellow, but close enough. Although I wish the bed skirt was about 1 inch longer as it is too short for my liking it still works find. The design is superb and it livens up your bedroom like a beautiful vase of flowers. I do also wish it came with either one or two more pillows though. However you can just get a couple of plain ones that match the colors. I wanted to order a Comforter Set that I could use Spring/Summer and then change it up with another in the Fall/Winter. This MiZone 4-piece Comforter Set is totally awesome. The are a few colors I am working with - Yellow, Gray, Black, White. It is striking in color and it is everything I was looking for. My bed size is Full, but the Comforter came in Full/Queen size. I love that. It gives you a little more Comforter to work with. My bedroom has now been transformed. Picture perfect. This is a beautiful comforter. The comforter is exactly as pictured. It's also very warm. I also bought a twin set of the same to use both sets on a twin-over-full bunk bed. News Years resolution #1 was to remodel the spare bedroom. 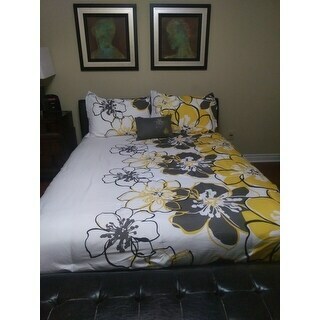 Purchased two Mi Zone Mackenzie comforter sets. The colors are eye catching and the design is lively, brightening the room. Because of the colors in the comforters, I have several choices for choosing draperies, and colored accessories for the room. I am pleased with the comforters and eager to finish decorating the room. The room will be a fine guest room. This comforter set is so adorable. Looks even better then the pictures. But true to size. I found this to be good quality. Nice and bright yellow color. Highly recommend this comforter set. Hello SPRING!!! I'm ready for the season and thanks to the MiZone Mackenzie comforter set, my bedroom is ready too!!! This set is so cute. The colors POP and the graphics are fun. The little pillow is adorable. It could have been a tad bit bigger, but it still fits well with the set. This set looks great on my queen bed, The material is supper soft and smooth to the touch. The colors are also vibrant. I do recommend this product. This set was a great price. The quality wasn't very high in my opinion, though. It is definitely lightweight fabrics. I didn't expect it to hold up very well but after 7 months of use in a child's room is doing surprisingly well. I wanted to mention the yellow has a gold tone to it. It wasn't the yellow we expected. I love it! It came very quickly as well!! This is funny. I just had this in my basket and was about to re purchase and thought it looked familiar...haha. This was purchased for my guest room...grey walls with yellow accent wall. It looks beautiful. quality is good for the price. the yellow is a true yellow and not gold like some other decor may advertise as yellow. I purchased for my guest bedroom and it works. my daughter loved it for her college dorm room. Design wise great, could be better with stuffing inside. Looked exactly as pictured. Good quality. The yellow color was exactly as it appears in the photos. Really brought a feeling of happiness every time I stepped foot into the room. I LIKE THE COLORS IT MAKES MY BEDROOM VERY HAPPY, I WILL BUY OTHER COLORS. THE MATERIAL IS A BIT THINER BUT I USE IT FOR LOOKS MAINLY. I loved the colors and print. However the quality is poorly made. So thin that you have to add additional blankets. I too afraid to wash it so I pretty much Febreeze it and let it air dry. "Do you have this in Queen Size"
We have this is full/queen size under the options tab. "I like this set, but can I get an extra set of pillows?" Hello Ana, we do apologize, we are not currently in stock with decorative pillows sold separately. Thank you for shopping with us. "I really want this pattern and color, but I need it for a King size bed. Is it made in this size??? Any suggestions??" Hello Hamilton, unfortunately no. This is not available for a king size. Please let us know if you have any further questions. We just purchased a new home and we are decorating our master bedroom in grey and yellow and thought this would be the perfect set. Looking forward to seeing it all put together! Hope it is as eye popping as it looks. "where can I get this pattern in a king?" Hello sharon, thank you for your inquiry! Unfortunately, this comforter set only comes in queen/full sizes. Hope this helps, have a great day! "I bought this set and I am completely in love with it, however, last night my dog ate the little grey pillow, is there any way I can purchase just the pillow?" Hi eviltwinkie215, Oh No! I'm sorry your dog got your pillow. These are only packaged in sets. We do not sell them separately. Have a great day! "I would like to know it there is shower curtain set to with the bed set 72x84'"
Thank you for contacting us strongbird. Unfortunately no. We apologize for any inconvenience we might have caused. Please let us know if you have any further questions.